“And I thought I didn’t need another Jewish cookbook...this cookbook has been in my kitchen for only a couple of weeks, and already it’s dog-eared." 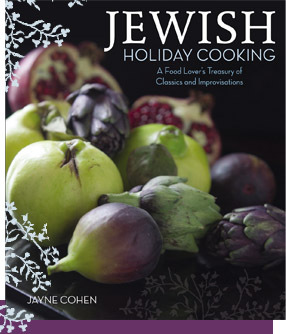 Jewish Holiday Cooking is now available as an e-book, featuring everything from the hardcover print edition in a very accessible, simple to search, easy-to-digest format. Part cookbook, part memoir and part how-to, this e-book joins Jayne's holiday e-miniseries, completing the collection. You can purchase it at Amazon, Barnes and Noble, ITunes, and wherever e-books are sold. A generous ransom paid for a much sought-after piece of broken matzoh. Horrific plagues re-created out of wine drops, and bricks from a scrumptious fruit and nut paste. So many raucous cousins the dining table must be stretched with bridge tables until it snakes around the front door. At every Passover seder Jews revisit magical childhood memories. A glorious ceremonial family dinner held this year on April 22nd, the seder brings to life the ancient Hebrews� liberation from slavery and their flight from Egypt. Nearly eighty percent of North American Jews--and many non-Jews as well--attend a seder every year, making Passover the most celebrated--and best-loved--of all the Jewish holidays.